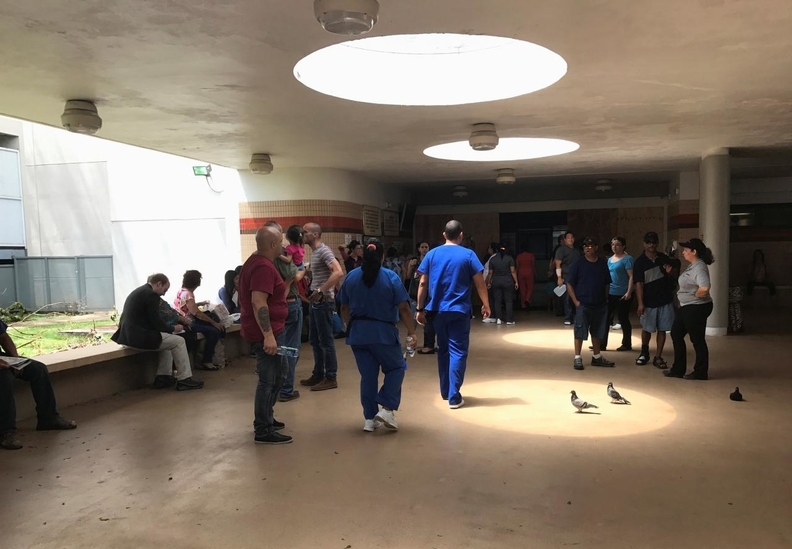 Nurses and patients at a San Juan hospital in Puerto Rico on Sept. 23. The one-two punch of hurricanes Irma and Maria have devastated Puerto Rico. The impact on the island's hospital system paints a grim picture for an already-fragile health infrastructure at a time when a slew of public health challenges are expected to arise. Most of Puerto Rico remained without electrical power late last week in the wake of the devastation left when Maria slammed into the island Sept. 20. Maria piled on to the damage wreaked earlier in September when Hurricane Irma sideswiped the island. It's expected to be months before all power is restored, with an estimated 1.6 million residents affected, the Federal Emergency Management Agency said last week. Years of systemic issues within Puerto Rico's health system and a delay in government aid following Hurricane Maria could make for a much more difficult and longer recovery compared with similar relief efforts in Texas and Florida. Communications were largely down throughout the island, with roughly 95% of cellphone towers out of service. Fuel shortages were reported in many parts, and nearly half of the population had no access to drinking water. Total cost of damage from Hurricane Maria could range from $30 billion to as much as $95 billion, according to market analysts. "Right now, the whole island, the infrastructure is devastated," Puerto Rico Gov. Ricardo Rosello said during an interview on ABC's "The View" on Wednesday. "This hurricane has hit every corner of Puerto Rico—we have no energy grid, we have little access to water—it is critical that we get more help." The situation appears especially dire for Puerto Rico's healthcare system. As of Sept. 26, only 11 of the island's 69 hospitals reported having either power or a fuel supply, according to a FEMA report, with 58 facilities described as "operational with unknown status." The American College of Physicians sent President Donald Trump a letter requesting that additional resources be sent to the island to aid in the relief effort, expressing concern that the situation could quickly turn into a humanitarian crisis if more is not done to get medical services up and running. As of Sept. 28, at least 16 people had died as a result of Hurricane Maria. "It is especially important the federal government's recovery and relief efforts prioritize making it possible for hospitals and other health care facilities to operate with adequate electricity, running water and sanitation, supplies, and medications, and to facilitate the ability of physicians and other health professional within the islands, and on the mainland, to provide assistance," wrote ACP President Dr. Jack Ende. The federal government's relief effort thus far has included sending more than 300 personnel from HHS' National Disaster Medical System to Puerto Rico to set up a base of operations with medical equipment and supplies near Centro Medico, an emergency and trauma center based in San Juan. According to HHS, medical professionals from NDMS and the U.S. Public Health Service Commissioned Corps assisted area hospitals, which they said were seeing an influx of patients while many facilities remained short-staffed. The federal government's response has thus far been noticeably smaller than the mobilization in the days after Hurricane Harvey hit Texas, or in Florida in the aftermath of Hurricane Irma. The difference has been a source of contention among critics who worry about the scope of the emergency affecting the island. Rep. Luis Gutierrez (D-Ill.) late last week announced plans to travel to Puerto Rico to assess both the damage and the speed of the recovery effort. "It has been more than a week and basic aid like food, water, medicine and fuel isn't getting where it needs to be to help people," Gutiérrez said Thursday in statement. "We can't allow inaction in Washington to create a humanitarian crisis for 3.4 million American citizens in Puerto Rico." Many feel the challenges facing Puerto Rico in Maria's aftermath could potentially take a much greater toll on the population's long-term health than what residents of Texas and Florida are experiencing. One of the more immediate concerns is the sustained loss of electrical power to many of the island's medical facilities. Getting electricity up and running is critical to ensure everything from powering dialysis and oxygen machines, to enabling hand and water sanitation, equipment sterilization, and refrigerated storage of vital medications. "Things can go from emergency to complex humanitarian crisis at the drop of a hat," said Lauren Sauer, an assistant professor of emergency medicine at Johns Hopkins University School of Medicine. Johns Hopkins currently has a team of six medical experts on the island of St. John in the U.S. Virgin Islands to offer expertise and support in the wake of the storms. Like the U.S. mainland, Puerto Rico's population has been aging for more than a decade, which in turn has led to a larger proportion of residents being in poorer health. While the island has similar life expectancy rates to the U.S. mainland, 35% of the island's 3.5 million residents reported being in fair or poor health, compared to just 18% of the population residing in the 50 states and the District of Columbia, according to a 2016 report by the Kaiser Family Foundation. Puerto Rican adults had higher rates of asthma, diabetes and hypertension than the U.S. mainland, conditions Sauer said will be difficult to manage in the wake of a disaster like Maria. Since 2010, Puerto Rico has experienced an array of outbreaks of such vector-borne infectious diseases as dengue fever, chikungunya and the Zika virus. Experts say such diseases have a higher risk of returning as debris left over from the storms create standing pools of water for mosquitoes to breed. "You're creating a population that fundamentally can't be cared for in a timely manner and it can turn into a complex situation that the healthcare system there may not be able to incorporate," Sauer said. Compared with the mainland, Puerto Rico poses greater logistical problems in distributing aid in a timely fashion simply because everything must be shipped by boat or plane; but larger issues could further complicate the relief effort. One concern is the fact that federal disaster funding is already being used to address the recovery efforts in Texas and Florida. Another involves the condition of the island's healthcare system prior to the storms. A combination of declining health investments and an exodus of healthcare professionals over the past two decades for work on the U.S. mainland has caused an economic strain for Puerto Rico. The island has been in the middle of a debt crisis totaling $73 billion. According to a January report by the Urban Institute, public and private healthcare spending fell by 10% between 2010 and 2014, about $1.2 billion. Congress is expected to use a portion of the $15 billion in emergency aid it authorized in the wake of Harvey to go toward the relief effort in Puerto Rico; the Trump administration is not expected to make a formal request for emergency funding until around the first week of October. "The Puerto Rican population is truly going to suffer the impact of Maria because it's the last of the disasters to hit so they're going to be last in line for resources," Sauer said.